Jackson’s current favorite song, besides the ABC’s, is “No More Monkeys!” He loves all versions of the song, and he is terribly cute singing along. 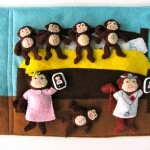 I *had* to design this page, even though I dreaded sewing 7 monkeys. It was worth it! It turned out very cute and has the added bonus of being a counting page. 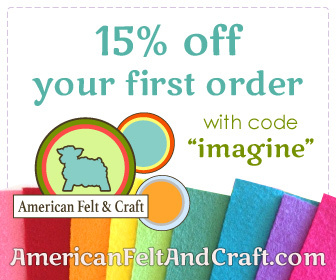 I made this page using leftovers from my stash of wool blend felt from American Felt and Craft. I pretty much used whichever colors I had enough of to cut the large floor and bed pieces. 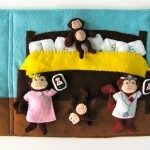 But, their felt colors are so rich and pretty and it came out great, scraps or not! 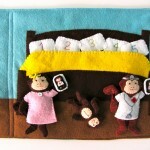 I started by stitching back stitched numbers onto the 5 pillows and 5 monkey bellies. I used rainbow colors of threads and stitched them freehand. I did the bellies while doing the pillows since I already had the right colors threaded on my needle. I set the bellies aside and stitched the pillows onto the headboard in a random arrangement. I pinned the floor on the page then sewed down the headboard. Next I sewed the yellow and white bed spread pieces together along the sides and top. 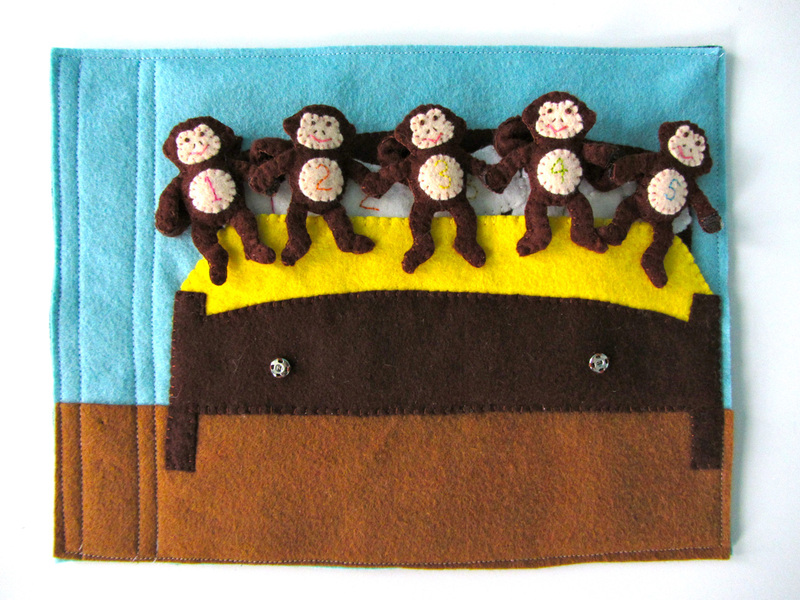 I pinned them behind the foot board on the page, then sewed around the foot board. I went back with yellow thread and stitched the sides of the bed spread down to the page. 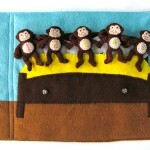 This made a nice big pocket for the little monkeys to sleep in. I added some snaps to the foot board that are used to hold mama and the doctor to the page. 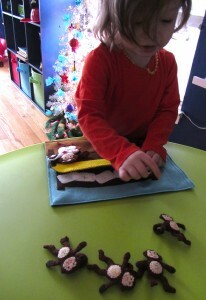 Monkey Assembly Line: I did all 5 monkeys at once, repeating each step 5 times. 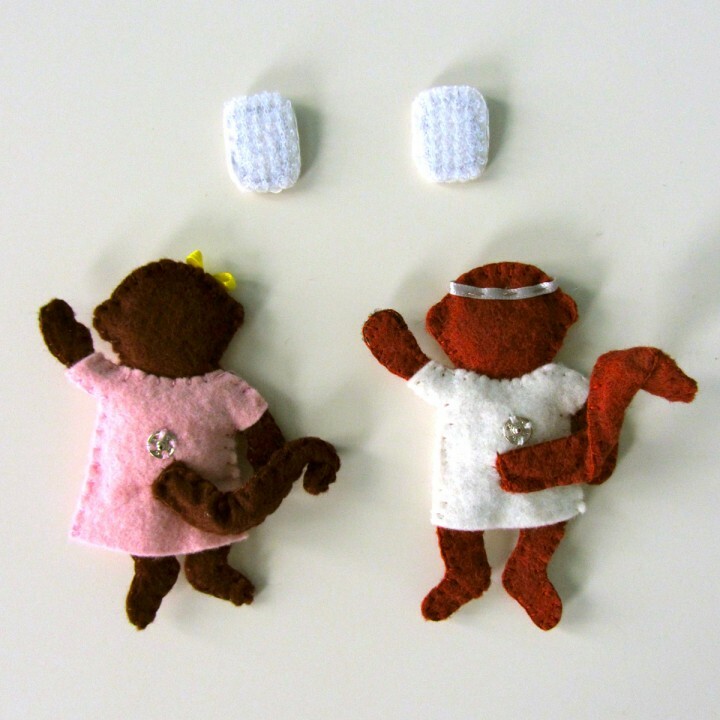 First I embroidered their faces: French knot eyes, slanted stitches for nostrils and long stitches for mouths. I then sewed the faces and (already numbered) bellies onto the front body pieces. 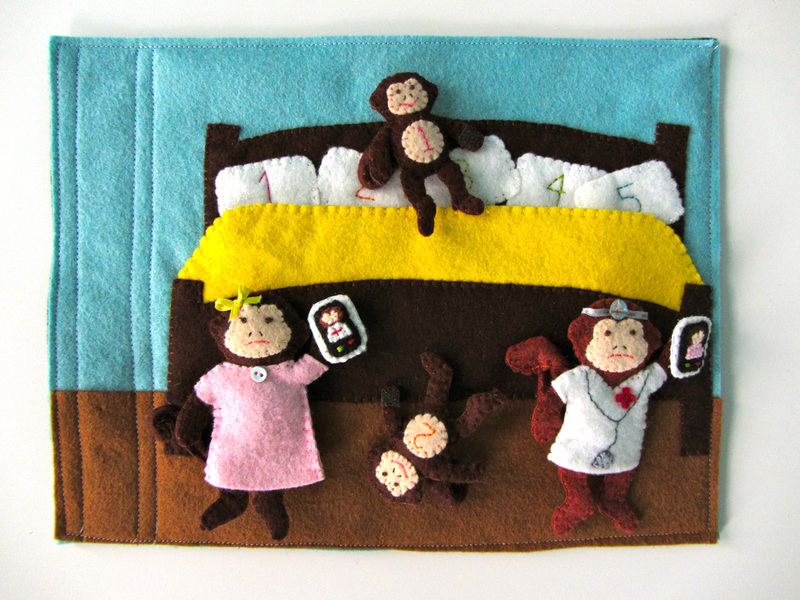 The monkeys all have brown hook (rough) Velcro on the front of their left paws (on the right in the above photo) and loop (soft) Velcro on the back of their right paws (on the right in the photo below). 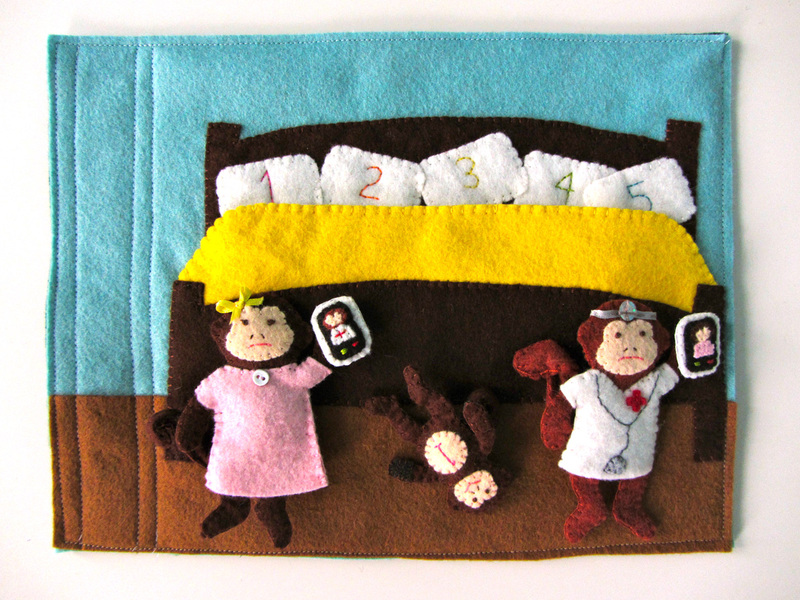 This lets them link hands and jump on the bed all together. They can also clasp their own hands over their bellies. I sewed my Velcro on while sewed the front and backs together, but you could do it beforehand. I added a little stuffing to their bellies for dimension. For the tails, I cut lengths of pipe cleaner and folded over the ends to hide the sharp bits. 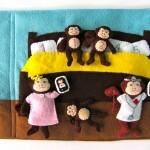 I sewed tubed of felt around them then stitched them onto their monkey bottoms. Phones: I went with smart phones! It was just so much easier to make them super cute. Sorry to all of you who would prefer a land line. I sewed tiny portraits of mama and the doctor onto the black screen pieces. There are pink or white semi circle for the torsos, brown ovals for the heads and a peach heart (without the point) for the face. The only detail I added was a red + for the doctor. I made some thick red and green stitches to act as call buttons. I then sewed the black screen on to the white front phone piece. 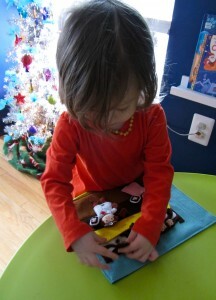 Instead of sewing felt onto the back, I cut the phone case out of snag-free Velcro and sewed that on as the backing. 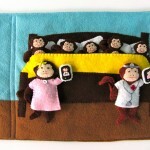 This lets the phones stick to the monkey paws but not the snag the page. Mama: For mama, I sewed her facial features first. She still have French knot eyes, but I added little stitches for lashes. I made her mouth frowning because mama isn’t down with her babies bumping their heads! I stitched her face on and sewed a little ribbon bow on her head. When sewing her two sides together (with stuffing in her head and belly), I added loop (soft) Velcro to the front of her left paw. You could probably make the nightie a separate piece that comes off. I sewed mine right onto her body, then stuffed her and sewed her limbs up. Her tail is the same as the little monkeys, just longer and sewn to her dress. I added a decorative button the the front and the other half of one of the snaps to her back. 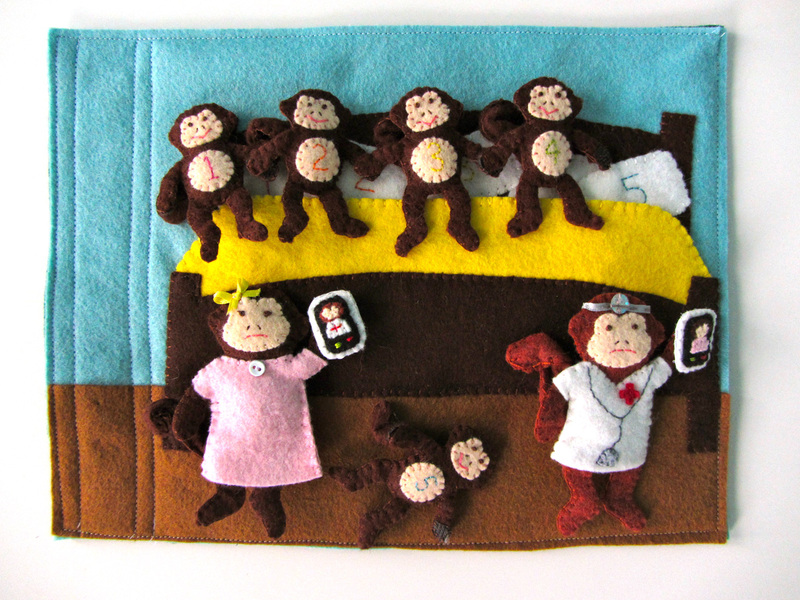 The Doctor: The doctor was done just like mama, but I decorated the front of his scrubs before sewing him together. 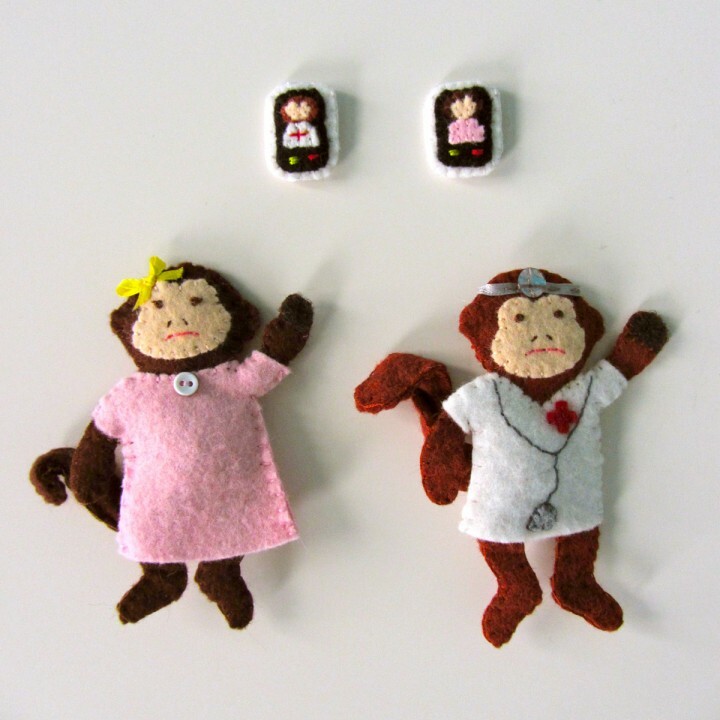 I stitched his stethoscope on and added a scrap of gray for the bottom part. I also sewed on his red cross. When he was all done, I stitched some silver ribbon around his head and added a silver sequin. Over all the page was very simple, but having so many monkeys and so little sewing time over the past tow weeks stretched it out a bit. But I love it as much as Jackson does! 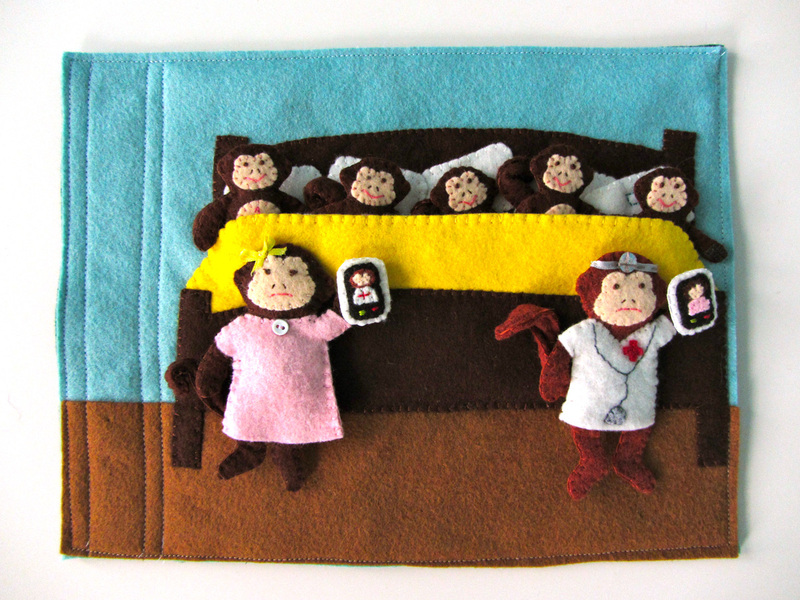 Jax’s favorite thing to do with the page is to place the monkeys in bed in the right order, then make calls to the doctor on the phone. And he has “No More Monkeys!” permanently in my head right now. I think we need a Christmas music intervention tomorrow! This entry was posted in Crafts, Quiet Book, Sewing and tagged Free, Patterns, Quiet Book, Sewing on December 12, 2012 by Stephanie. Your work is truly amazing! Thanks for the pattern too. Oh My Gosh, I am soooo glad I found your blog. You are AMAZING!!! Thank you for sharing your talents so freely with all of us. Jackson is one very lucky little guy. Great job! This page turned out wonderful, just like all your pages do!! Thank you so much for sharing. I am really excited to make this for my Lily. Hello! Working on this page now. It’s so cute. 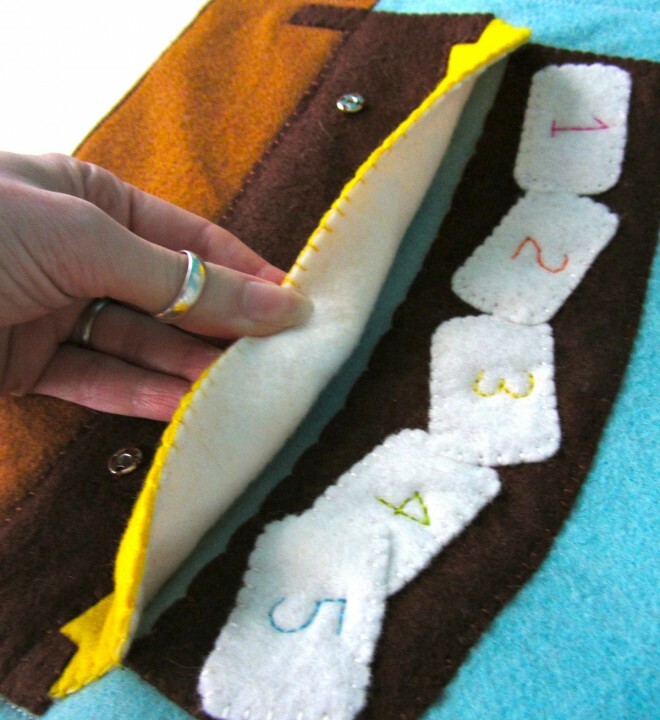 Question… Where did you find snag-free Velcro? Thanks. Thanks! No luck at the craft store so far but maybe I will do amazon next. I just wanted to say thank you so very much!!! I just found you today-saw quiet books on pinterest and created a board to store inspiration, did an internet search and many hours later here I am, practically obsessed with the stuff! I’m grateful for this theme in particular because I have five kids and I’ve sung/read this story to all of them, it’s perfect for the book I’ve started for my youngest!! Im really in love with this, its sooo cute, i was working like aupair not long time ago, and this song was the favourite one of my kids, is also especial for me for that reason. 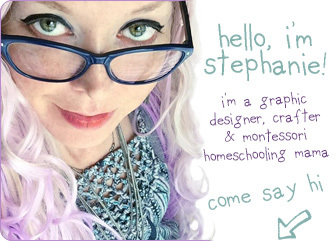 has been great to find your web, thanks for sharing, you have given me lots of inspiration for making me own ones!!!! Kisses from spain!! Love this page! Question: Did you fit this page into a 9 by 9″ window like many of your pages? Because when I printed the templates the bed was much wider. Which size page space did you use for the bed? Hi Krista! I originally started out only using the 9×9 area of my 9×12 felt sheets for the page content. I later realized I had about 10″ wide x 9″ high after my binding, so some newer pages use the full space for the background elements. 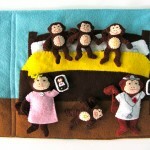 Love this but hate cutting out tiny monkeys!!! My white pencil isn’t showing up on the felt. And I think I need to use tiny scissors. 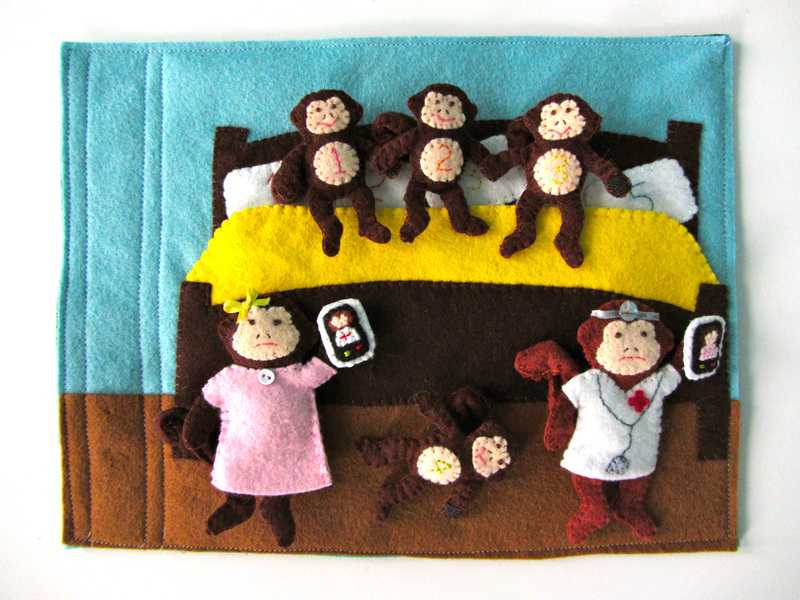 Also, your pattern says I need 10 little monkey faces and 10 little monkey tummies. Are they layered or was that a mistake? Sounds like a mistake… I’ll have to take a look. Thanks! And, I was over those monkeys by number three! 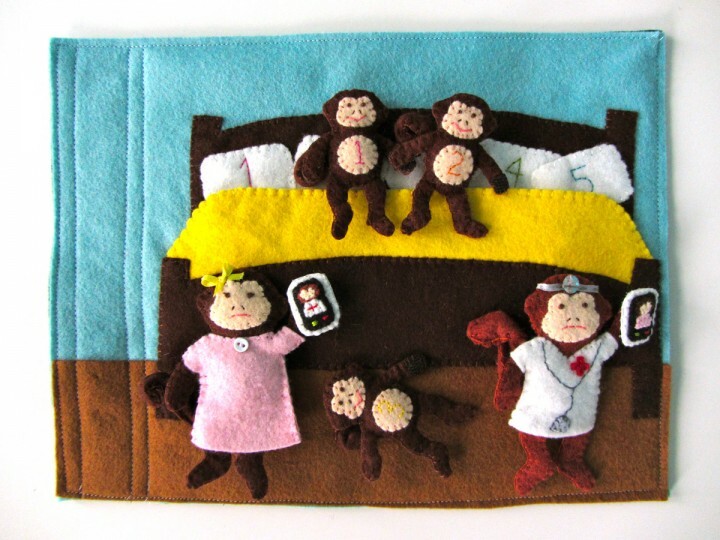 Do you sell your Quiet Book “Five Little Monkeys?” I am loving it for my 2 year old grandson but have no crafting talent. Nicole Delp recently posted..It was the best of times, the worst of times. im looking for ideas to make my daughter a quite book and ran into your pages. You are really talented, thanks for sharing!